Passing off your weekly grocery shopping to an app that handles all the hassle for you sounds like a great idea—on paper at least. One of the biggest concerns users may have about the experience aside from pricing is if the concierge shoppers are actually picking the best items. Are you getting fish on the cusp of going bad? Are you only getting fruits on the wrong end of ripe? It’s a legit concern, something I usually think about too. But this apparently isn’t an issue for delivery app honestbee as they claim to have trained their concierge shopper bees to “pick the freshest produce, vegetables, fruits and meats”. 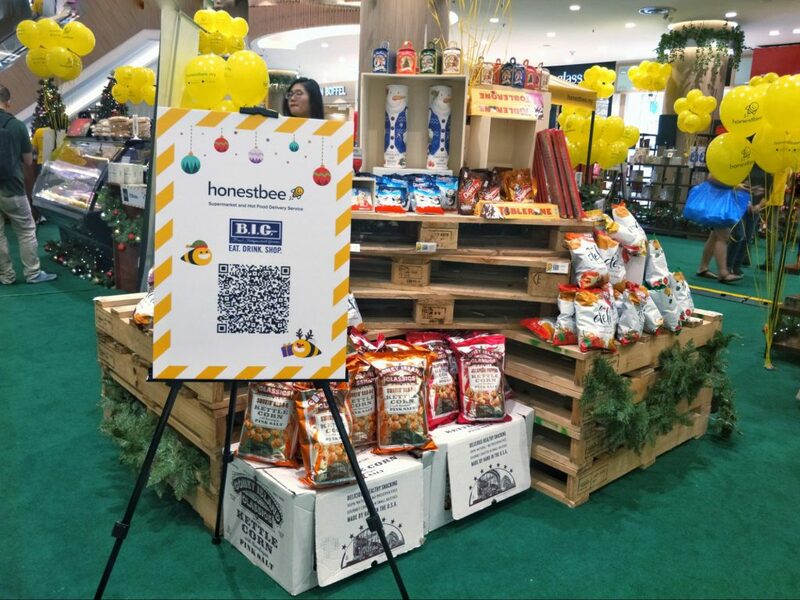 And to really drive that point home, the honestbee team has launched a Christmas Pop-Up Store at Lot 10. The pop-up store event is currently happening in Lot 10, Kuala Lumpur from now until the 1st of January. 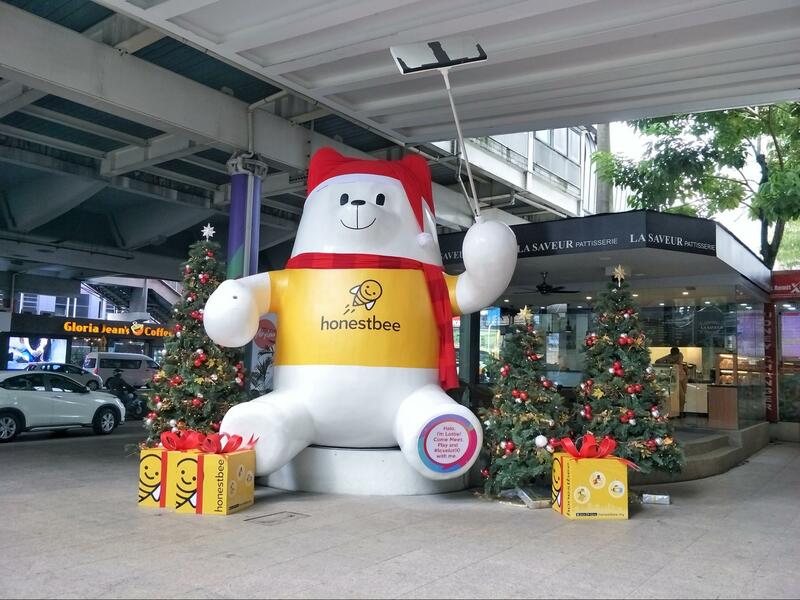 You won’t be able to miss it; find the the entrance with the giant honestbee bear taking a selfie. Look to the right of the bear, and the pop-up store is just a 30 second walk into the mall from there. This bear is honestly taking a selfie. Upon walking in, we got a glimpse into how their shopper bees usually do their jobs. On a surface level, it looks exactly like a pop-up bazaar. 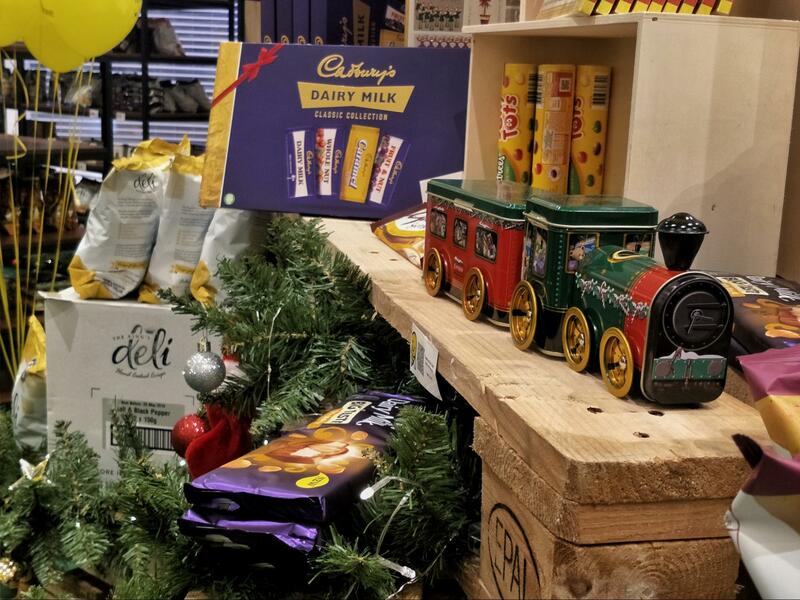 Their current offerings range from food made fresh, to snacks and presents that you can buy off the shelves. We saw some familiar names such as Ben’s Independent Grocer, O’Briens Irish Sandwich Cafe, Pezzo Pizza, The Bowls, Okashi World, and Amazin’ Graze. The key difference though (and to our amusement), we had to make all our purchases on an app! It was a true cashless experience. An honestbee staff approached us then and guided us through the process. We were told that we had to order on the honestbee app first; alternatively, you can add items to your cart on-the-go by scanning the product QR codes on display. We watched in real-time as concierge shoppers in yellow t-shirts picked up our orders and bagged them right in front of our eyes. There’s no room for confusion since the employee guided us through the entire order process on the app and we were able to see exactly where our food is coming from. Meanwhile, customers who aren’t ready to download the app on their own device can head to the station where honestbee have prepared tablets to make orders from. 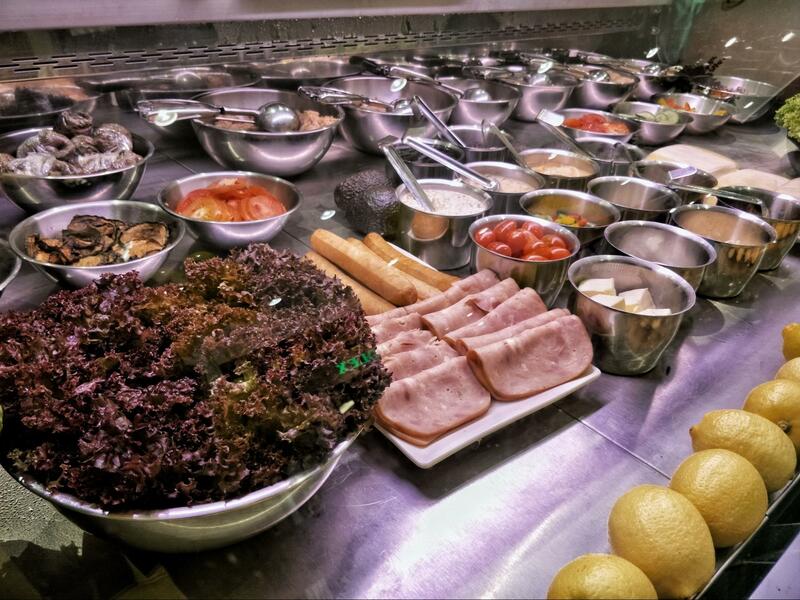 There were a few stations around like Ben’s Independent Grocer to get freshly made meals and we could see it being made from the fresh ingredients they had displayed. 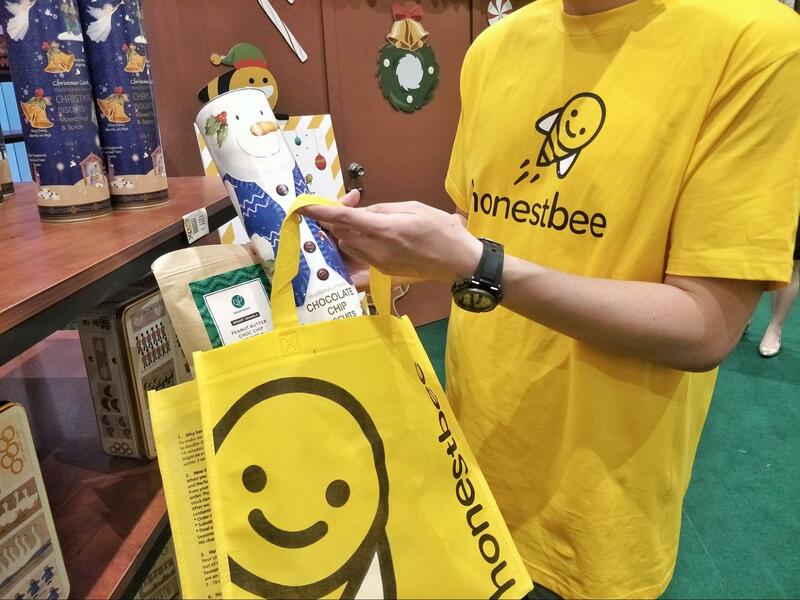 Honestbee did share that they’ll be bringing more fresh items into their pop-up stores in two weeks. So if you’re looking for an authentic look on how their concierge has been trained to pick out their goods, you can drop by then. 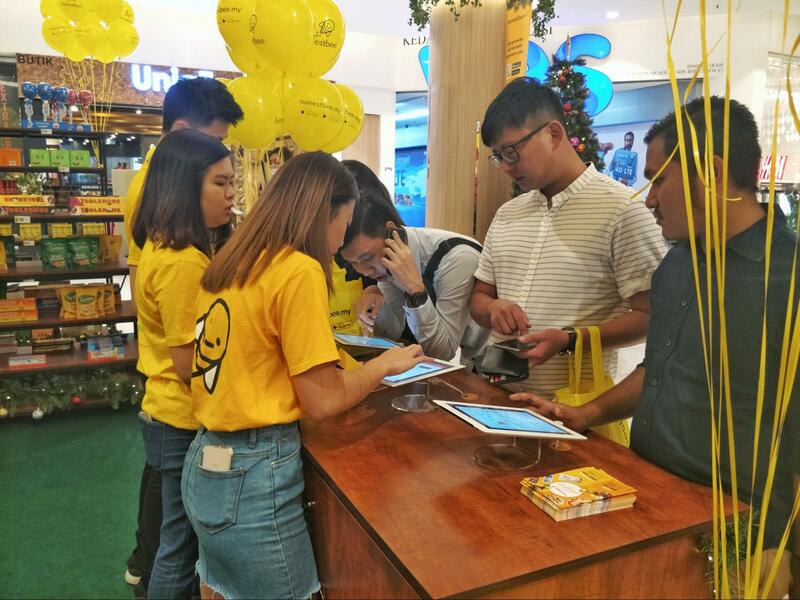 MyDIGI app users can get RM35 off, along with the opportunity to win prizes up to RM10,000 when you stop by the store and play the DiGi game. 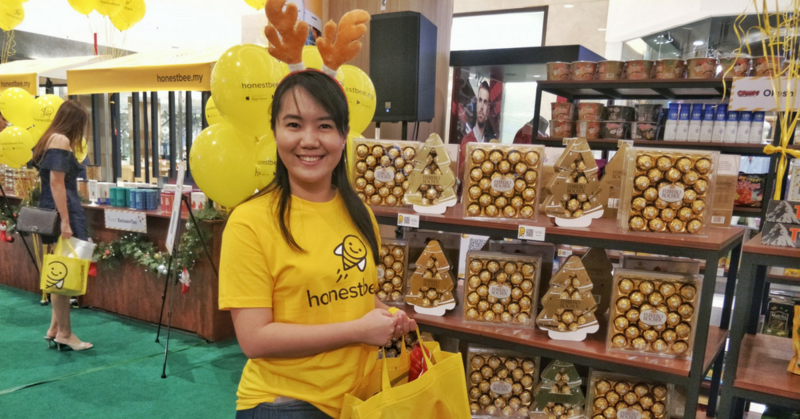 Individual stores are joining in too with their own offers (RM5 coffee from O’Briens comes to mind) and you can keep a look out for honestbee staff who will be walking around handing out flyers with discounts on them. This is an interesting way for an online-based business to really showcase to consumers what they’re all about, while hitting a real pain point—shopping for a festive occasion like Christmas and having to wait in long lines to pay. At the pop-up store, the convenience was appreciated as we could checkout our orders using their app so there really was no queuing at all. The team explained it well what they’re on about in the most on-the-ground way possible while demonstrating how the app works. It’s a nice way for a food and grocery app like honestbee to use this pop-up store at Lot 10 to be more engaged with their users as a brand. They can be on-ground and understand their customers better in terms of what they’re looking for when shopping. Use promo code POP30 to get RM30 off with a minimum spend of RM80. Use promo code POP10 to get RM10 off with a minimum spend of RM50. Use promo code POPFD5 to get RM5 off with a minimum spend of RM10. All these codes are only valid at honestbee’s Christmas Pop Up Store. You’ll have until January 1 2018 and can’t be used with other coupon codes unless otherwise stated.